When I was a kid growing up in Preston there was an amazing Caribbean cafe close to where my dad worked, and it was there that I was first introduced to the delights of rice and peas, and ackee, and dumplings, oh the dumplings… there was a stall selling them at the northern vegan fair in Blackpool last year so I had to buy one and it was as good as I remembered! The cafe closed (and became a polish one where I discovered perogi and zebra cake, but that’s a whole other post…) and for ages I only really ate that type of food once a year at the Preston Caribbean carnival. But becoming vegan and the amount of recipes around which use ackee so creatively reminded me what I was missing! The last time I cooked with it I made a veganised saltfish and ackee recipe, which uses nori for the saltfish flavour which I thought was a stroke of genius! This time however, I wanted to continue with the sea vegetable theme, and try it with samphire instead. The ackee itself has a mild, very slightly bitter flavour and a wonderful silky texture. And it looks just like scrambled eggs, hence the classic vegan way of eating it, as a breakfast scramble! I’ve paired the ackee and samphire with a delicious, savoury mixture of rice, lentils, leeks and tomatoes with plenty of fresh herbs stirred through at the end. It’s incredibly moreish, and a great treat as unfortunately ackee can be rather expensive… I got mine on offer from tesco a little while ago, but it was still £3 a tin! To make the herby lentils and rice, heat the oil in a saucepan on a medium low heat and cook the leeks partially covered, stirring often for 10 minutes, until softened. Add the rice, lentils and garlic and cook for a further 3 or so minutes stirring all the time, until the rice begins to look translucent. Add the stock and tomatoes, give it all mix and turn the heat to low. Cover the pan and leave to cook for 40 minutes. Turn the heat off and leave the pan covered for 5 minutes. Stir through the herbs, and salt and pepper to taste. For the pickled samphire, simply mix all the ingredients together in a bowl. Set aside for 20 minutes. 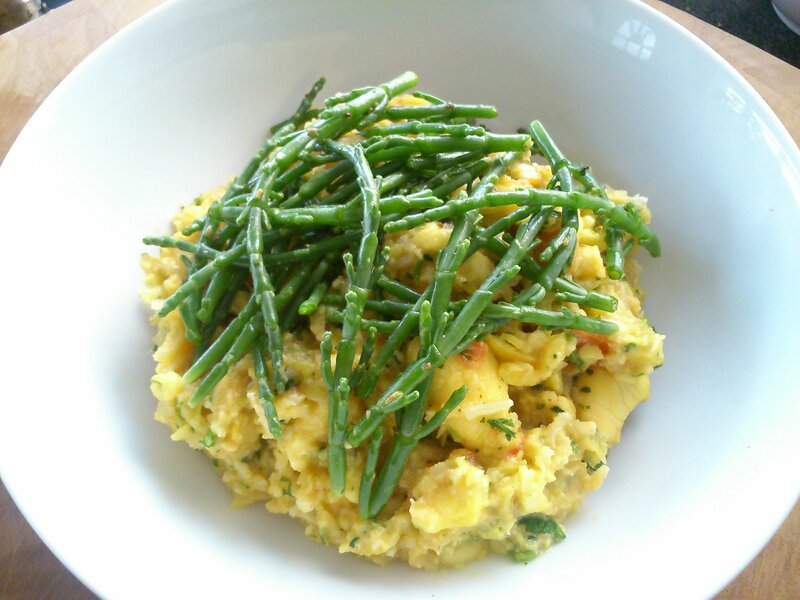 To serve, stir the drained ackee gently through the rice mixture, and top with the pickled samphire. Thank you! 🙂 Ackee is totally, utterly different from capers… I promise! Yum! Looks amazing, thanks for the share!